The first three trading games developed by Richard Garfield and produced by Wizards of the Coast were Magic: the Gathering (1993), Vampire: the Eternal Struggle (1994) and Netrunner (1996). All of these were branded as part of the so-called “Deckmaster” series. But in fact, had little in common other than being trading card games and using the tapping cards (rotating cards by 90 degrees to indicate that they’re being used). The brand name was actually never really used/marketed ever, since the buyers and players never really cared if a particular game was part of the series, but since the cardbacks had been printed in that fashion in the first editions, Wizard decided not to change them anymore. 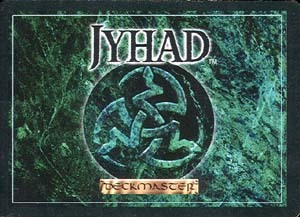 (Actually they did when the name of VtES changed from Jyhad to Vampire the Eternal Struggle (in 1995), but they didn’t change the Deckmaster label). Due the belonging to the “Deckmaster” series, the cards of the series had (approx.) the same dimensions. A deckmaster card ..
.. weighs 1.814 g (about 0.064 ounces). the similarities in concept are suspicious enough.